2nd Annual Ref4Rett Event Update!! 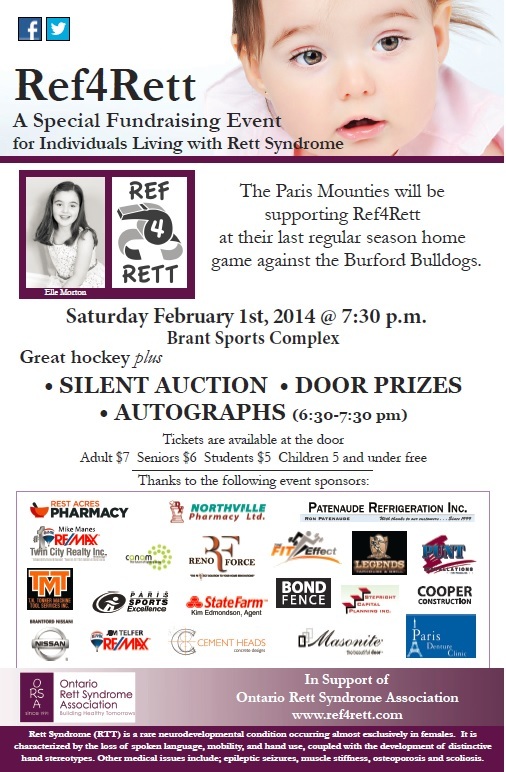 Please join us for the 2nd Annual Ref4Rett Event on Saturday, February 1 at the Brant Sports Complex. It is set to be a night of great fun and great hockey!! The Paris Mounties will be having an Alumni Game from 5:30 – 7 pm. Our MC for the evening is Ed MacMahon from Jewel 92 (www.jewel92.com). The World’s Greatest Hockey Dad, Mr. Walter Gretzky, will be signing autographs from 6:30 – 7:30 pm . There will be live entertainment, featuring Joshua David Peidl, from 6:00 to 7:30 pm (http://www.reverbnation.com/joshpeidl) . The Paris Mounties last regular season game against the Burford Bulldogs will begin at 7:30 pm with a ceremonial puck drop by our very own, Elle Morton. Our Silent Auction now has well over 100 great items and during the first intermission, 2 lucky individuals will be shooting to win a 2014 Nissan Altima courtesy of Brantford Nissan. Brant News Helps to Raise Awareness! !